First line: "Look around you. What do you see? If you're inside, you might see walls, carpeting, furniture. If you're outside, you might see grass, buildings, sky. But the world is a lot more complicated than it seems." 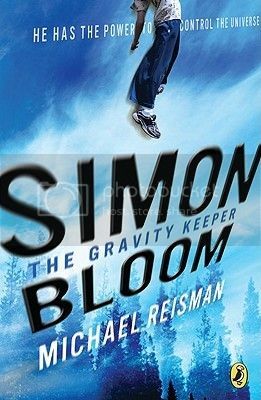 Simon Bloom's life is turned upside-down when he discovers the "Teacher's Edition" of his classroom physics textbook, which magically gives him power over the laws of physics. He manipulates gravity and friction, allowing him to float, fly, zoom or slow down. After accidentally eavesdropping on a group of excessively silly senior wizards sporting wacky psuedo-medieval names, he finds himself unavoidably caught up in the action. The evil Sirabetta is able to control several different branches of science (magically) with various tattoos that seem to writhe all over her body. Of course, she is hoping to add the book of physics to her collection. Simon's two best friends, Owen and Alysha join him in trying to keep the magic book out of the hands of villains. Owen has a rather annoying habit of speaking-so-quickly-that-all-of-his-sentences-are-rendered-in-dashes, and Alysha is a bit of an outsider at school who joins them in their expeditions to Dunkerhook Woods. Only towards the very last third of the book do Owen and Alysha start to come in to their own, gaining the power of velocity and electricity, respectively. In a way, I was disappointed to see Owen and Alysha lose their powers so quickly. Plenty of inside-jokes seemed geared towards Douglas Adams' Hitchhiker's Guide to the Galaxy fans, which might go over the heads of the intended audience. In many ways, Gravity Keeper reminded me of the Angie Sage's Septimus Heap books, but with a more scientific bent. An omniscient narrator, similar to one in A Series of Unfortunate Events provides comic relief. Fast-paced, inventive and fun, I'll recommend this new series to any budding science-fiction fan. I'm always on the lookout for series I can recommend to middle-grade readers. I have a couple of loyal library patrons who seem to have read EVERYTHING!